SOFIA, BULGARIA: April 12, 2019 - Marie Oteiza of France delivered a commanding performance at a rain-soaked UIPM 2019 Pentathlon World Cup Sofia to take gold and boost her chances of qualifying for the Tokyo 2020 Olympic Games. World No.6 Oteiza (FRA) dominated the Fencing with an exceptional 27V/8D and she never looked like relinquishing her lead after that. Taking a 21sec advantage into the Laser Run, Oteiza (FRA) retained her composure to keep London 2012 Olympic champion Laura Asadauskaite of Lithuania at bay in challenging conditions brought on by torrential downpours. Alice Sotero of Italy won bronze after moving up from a starting position of 7th in the Laser Run. Francesca Summers of Great Britain finished 4th to add to her 6th place from Cairo, while Gulnaz Gubaydullina of Russia was 5th. 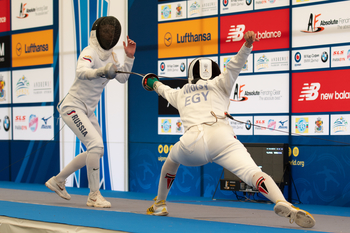 Pentathlon World Cup Cairo winner Uliana Batashova (RUS) followed her compatriot over the line in 6th. 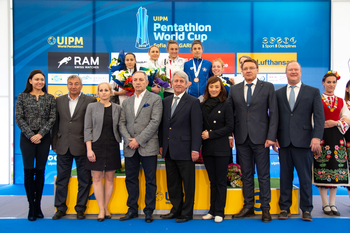 Oteiza (FRA) was delighted with her success after finishing 12th in the season-opening UIPM 2019 Pentathlon World Cup Cairo in March. “It was a hard race,” said teiza (FRA). “I had to stay focused on the shooting to have a good run to stay in first place. I'm so happy. Asadauskaite (LTU) was also happy with a satisfying return to form after undergoing surgery on a leg injury. The 35-year-old had been out of competitive action for 10 months and was delighted with her silver, which featured a typically fast Laser Run – she had started in 15th position. “I had an operation but now I've come back and I am very happy,” said Asadauskaite (LTU). Sotero (ITA) held off a determined chasing pack in the Laser Run to take bronze and climb the rankings following her 16th place in Cairo. Swimming specialist Gubaydullina (RUS) scored another victory, adding to her win in Cairo and proving she is the woman to beat in the pool. Sotero (ITA) took second spot with Oteiza (FRA) third. Oteiza (FRA) stormed into the overall lead with a stunning 27V/8D, improving on her third spot from Sofia in 2018. Volha Silkina of Belarus fought her way to second while Summers (GBR) was next-best on the piste. Last year's fencing winner, and overall champion in Sofia in 2018, Natalya Coyle of Ireland, was ranked 16th. Oteiza (FRA) cemented her position at the top of the leaderboard with an almost perfect ride in challenging conditions. Torr ential rain at the start of the riding event failed to stop the Frenchwoman going round with no obstacles down and only a two-point time penalty. 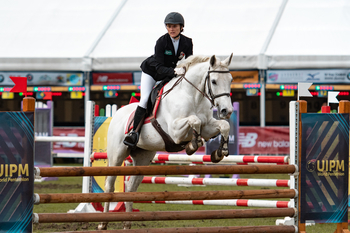 Silkina (BLR) also left all fences standing and stayed on the tail of the leader with only a two-point time penalty. That meant Oteiza took an impressive 21sec advantage over Silkina (BLR) going into the Laser Run. With the heavens opening and parts of the course resembling a mud bath, it was perhaps a surprise that four riders scored a perfect 300. At the same event in Sofia last year, none of the competitors managed the feat. Oteiza (FRA) held on to her comfortable lead throughout the final event, with only a stuttering performance on the third visit to the range giving the chasing pack any hope of catching up. However, she roared through the fourth and final shoot to give herself a clear run to the finish line. Behind her, the race for second was red hot, with the veteran Asadauskaite (LTU) digging deep near the end of the third lap to open a gap on Sotero (ITA). Asadauskaite (LTU) showed her experience as she held Sotero (ITA) at bay in the final lap and crossed the line second. Early contender Silkina (BLR) dropped back in the run and finished 7th. UIPM President Dr Klaus Schormann said: “Today, we have been looking to the weather conditions. It has been difficult for the athletes, for the horses, but we had a great performance in the riding. “We were nervous as it was raining and raining, but the way we sawthe athletes come from behind, as [Asadauskaite] did, coming from 15th to second … we have this great dynamic with the Laser Run. So we had a great competition day. 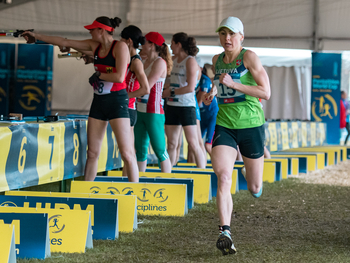 “There was a big number of athletes competing here, I think it was nearly a record for the women's race, and to have this high-level performance under these conditions, I have big respect for the athletes. “[Oteiza] was so far ahead, but to the end she gave everything. That is what we want to see. They want to give the best and show that they are trained and prepared. 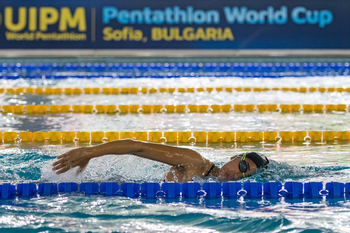 Pentathlon World Cup Sofia continues tomorrow (April 13) with the Men’s Final and concludes with the Mixed Relay on Sunday, April 14.